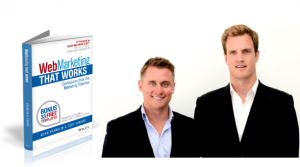 You can download your free first chapter of Web Marketing That Works (26 pages, 948 KB – PDF) and it’s also in your inbox. Buy the whole book for $25 USD. Buy our Amazon #1 best seller Web Marketing That Works. It includes shipping anywhere in the world. 2. No thanks – I’m happy to work this out myself for now. Just the free chapter please. Regardless of what you choose, a link to the free chapter has been been sent to the email address you supplied, so you can access the them at any time. The email has our personal details on it, so if you have any questions or feedback, please feel free to get in touch. Register here for the exclusive On-Demand Webinar hosted by Adam Franklin.